I have a one and half year old. ONE AND A HALF! I just can't believe it. Time is going by much too quickly. I want it all to slow down so that I may soak up each & every moment that he is this curious, inquisitive, innocent little boy. Who is also a hipster these days... 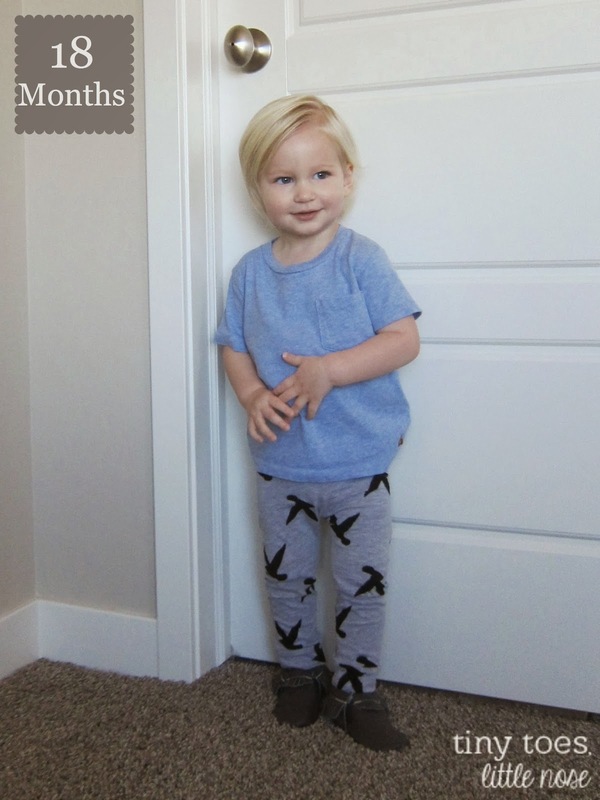 I think he pulls off these leggings & moccasins, even though we stick to a preppy style most of the time. 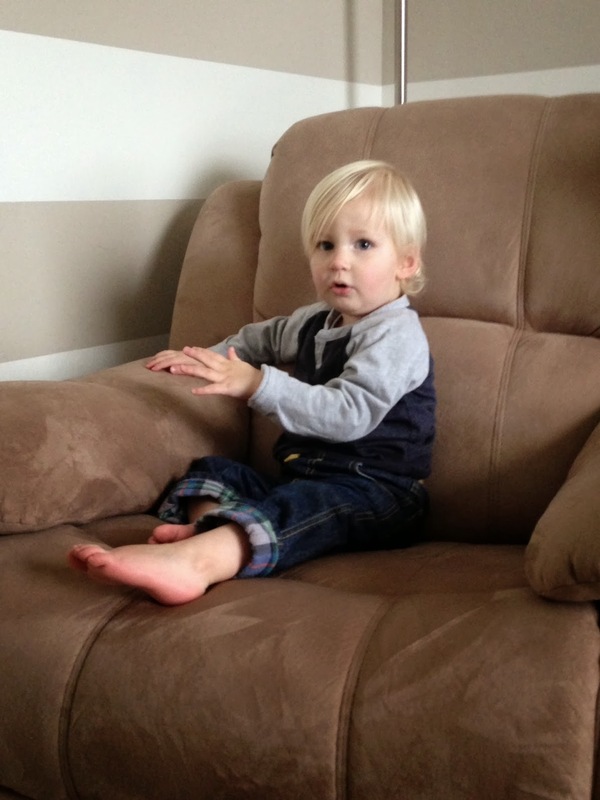 :-) Here's his monthly update where I get to brag, brag, brag all about Liam! Stats: Height: 34 inches (92%) Weight: 22.66 pounds (11%) Head: 18.8 inches (51%) He's our little skinny minny! Favorite Foods: Cheese still reins supreme as his absolute favorite food. He asks for it practically all day long. More recently he has been wanting to help me shred it and then eat it off a plate; or he likes to use the cheese slicer. Regular ol' string cheese just isn't cutting it anymore. He has also taken a liking to Cliff Kids Z bars, although he only eats little nibbles off of them. Breastfeeding: Some days he's a nursing machine, other days it's only 2 or 3 times. He still nurses throughout the night, although sometimes I will cut him off and he only fusses for a minute before settling himself with just snuggles. We both are still enjoying the nursing relationship and so we will continue. I've thought about implementing the "don't offer, don't refuse" mentality as he gets older, but with him being so skinny I'm not sure we're quite ready for that step yet. New Words: His vocabulary is growing & growing, it would be so hard to list all the new words he's learned. However, I do want to note that he is using multiple words together now. Not in sentences by any means, but he'll string different words together to let me know what he wants. 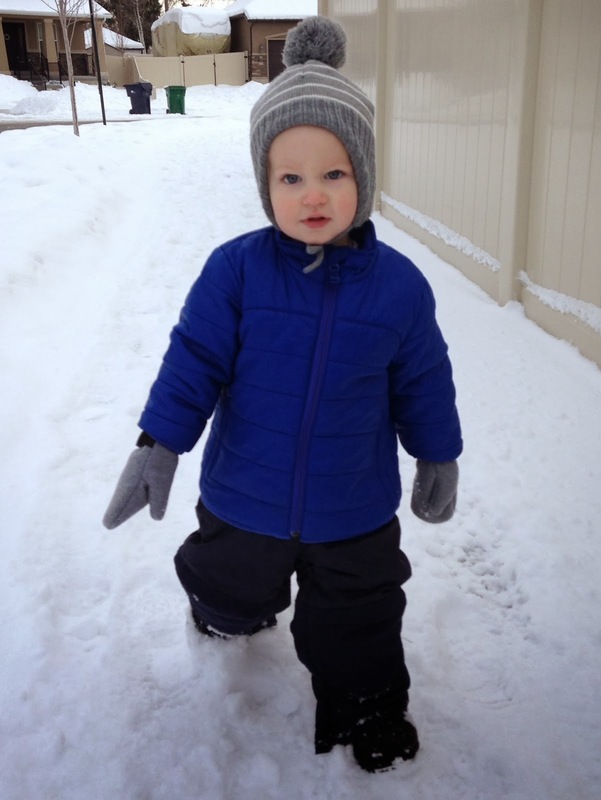 For example, yesterday he wanted to go outside so he told me "coat, walk, brrr." Our pediatrician was super impressed with his speech! Sleep: I recently wrote a lengthy little post about our sleep journey here, in case you missed it. Liam's has officially dropped to 1 nap, and I am perfectly fine with that. Our days are much easier to plan out now. He's fairly easy to put to sleep, and will sometimes even tell us when it's time by saying "night night." He gives both Conor & I and a hug and kiss right before we climb into bed. I all of sudden have this big boy on my hands! When did that happen?! Favorite Interests: Cars, trucks, airplanes, trains, buses, etc. He is all boy these days! The vroom vrooms & the beep beeps are taking over my life. He also loves helping me with the household chores. If I tell this kid we need to do some laundry, he squeals with delight and starts running to the basement. He will hang up laundry on the bottom racks that he can reach. Absolutely adorable and even sometimes actually helpful. The kitchen counter has become his new favorite seat, where he loves to watch me prepare meals and desperately tries to help as much as possible. I need to find or build (well, Conor can build) and good stool that will put him at kitchen counter height. I see a little sous chef in our future. Hide-n-seek ("peekboo") has also become a favorite game in the evenings. Conor or I will go and hide, and Liam runs around like crazy looking for us. He tackles us with giggles once we are found. He continuously yells "peekboo" the whole time. This has become one of my favorite games. Life with Liam is different each day. He is really turning into this little person with different moods, wants, & preferences. Some days he wakes up perfectly happy and ready for the day, other times it's as if he woke up on the wrong side of the bed. He is quite the teenager toddler. He now knows exactly what he wants and tries to make that clear to everyone. We have been playing musical chairs at the dinner table lately, trying to figure out which chair Liam wants everyone to sit in. His highchair is currently collecting cobwebs at the end of the table, because he is refusing to sit in it anymore. It's fun to watch him grow and assert himself... I'm sure I'll be eating these words at some point. My days spent with a toddler are exhausting & exciting all the same time, and I wouldn't trade it for anything. I'm sure he is going to start challenging me more, but with that comes better communication and more fun for us both. I'm ready for all that this little boy has to throw my way! Where did you get the shelving unit in the last picture, I'm trying to get something to organize my sons massive amount of toys and having a hard time finding what I like. That is hilarious about the tomatoes! 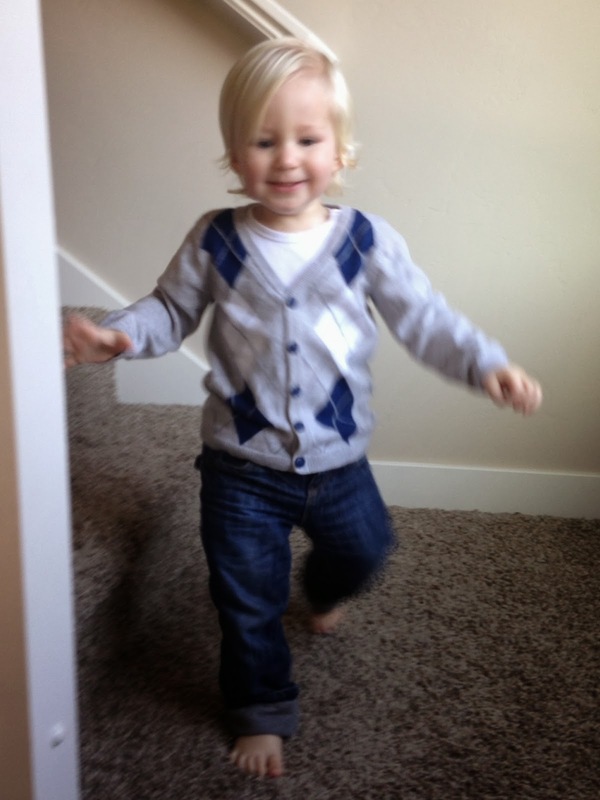 Luckily, Liam keeps his clothes relatively clean, because I love dressing him while I can! Great, I may go check there today, being they are sending us all home for an ice storm here in Charleston. 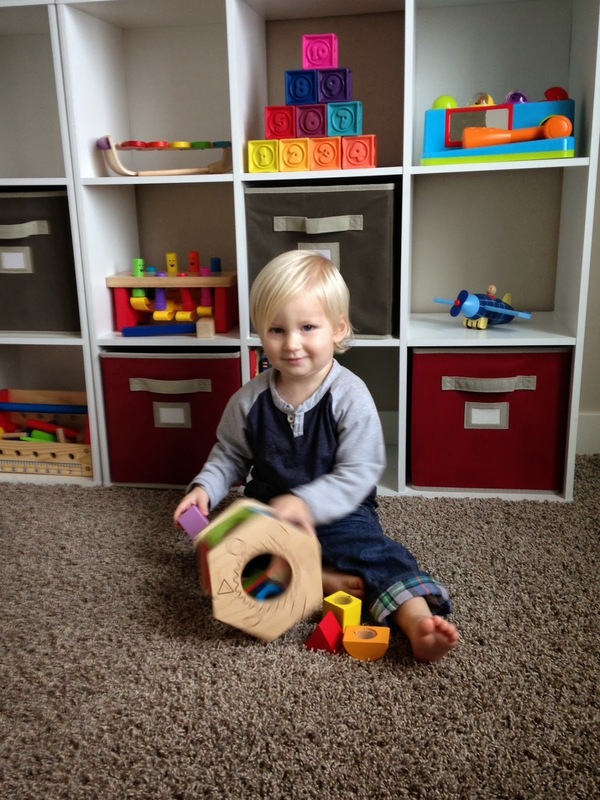 What better way to spend the next 2 days stuck inside then building shelves with my little carpenter. He is absolutely adorable and deserves to be bragged about! It's amazing how they really do become little people! He's such a cutie pie! Can I just say I'm DREADING when Abbie goes down to one nap! Loooooove his hipster look!!!! Happy 18 months, Liam!!!! oh my goodness, I'm dying--he is adorable!! Happy 18 months to the cutest boy! Thank you! I think so too... But I may be biased! I just came across your blog and I think its absolutely wonderful. I am curious to know if you always had plans to do extended breastfeeding, or if it is just something you fell in to? Before I was pregnant I definitely didn't plan on extended breastfeeding. I thought nursing for a year would be good. Once I became pregnant and started reading about all the benefits and attending La Leche League meeting I started to have an open mind about it. Then once I had Liam, I fell into am attachment parenting style and now feel pretty strongly about letting Liam self wean. Nursing has been such a wonderful part of our relationship. Hope that answered your question! Yes thank you very much, my son is almost one and is not anywhere near ready to stop nursing. It is comforting to hear other people who have similar situations.